MCU (zeolite oil filtering) plants are designed for the companies involved in generation, distribution and transmission of electrical power, as well as the enterprises engaged in the installation and repair of oil-filled high-voltage equipment with voltage up to 1,150 kV. The plant is designed for drying and reclamation of insulating oils with viscosity which does not exceed 70 cSt at 50°C. The plant consists of special chambers, which can be filled with zeolite or silica gel. Depending on the type of adsorbent, the main purpose of the plant may vary: when using zeolite – it is used as an electrical oil dehydrator, and when using silica gel – it is used for partial reclamation. Oil processing with МЦУ type plants – cleans oil from solids, removes water, reduces acidity and increase the breakdown voltage. GlobeCore equipment maintains operating parameters of insulating oils helps to extend oil service life and increases the operation reliability of power transformers. GlobeCore sorbent technologies of purification and recycling saves money on purchasing new oil and on disposing of waste oil. GlobeCore considers all requests and specifications from their clients – in manufacturing customized plants. And with production model meeting set requirements, it is shipped directly from the warehouse. The main GlobeCore production facilities are based in Germany (Oldenburg). The plant can be successfully delivered anywhere in the world. GlobeCore also provides services for staff training of and post-warranty repair of oil purification equipment. The Director of a company, engaged in generation, distribution and transmission of electrical power, or a company providing installation and repair of oil-filled high-voltage equipment with voltage up to 1,150 kV. Does a matter of waste transformer oil cause you serious problems? Are you interested in getting the maximum financial savings? Do you want to use innovative solutions? Buyer, Supply department manager. Do you only want the best deals on high quality and low price? Do you want to build and maintain long-term relationship with your supplier? Electrical Supervisor General responsible for maintenance and repair of electrical equipment. Are you interested in equipment performing with minimal interference? If your answer “Yes” to the above questions, then we are on the same page! 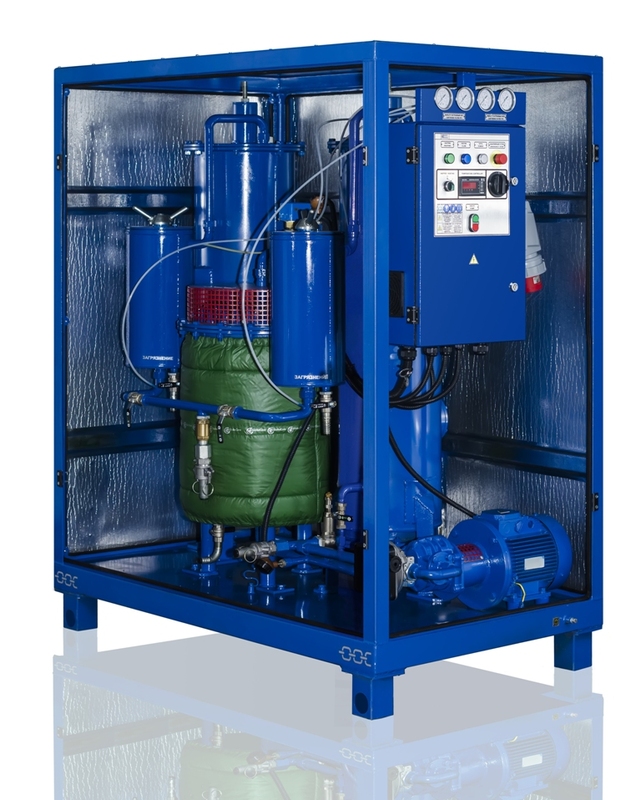 GlobeCore oil purification and recovery plant will solve all your problems! Over the years, our company established friendly relationships (both corporate and personal) with customers, helping us to constantly improve existing equipment and develop new equipment. Versatility. It can be used for drying oil (using zeolite) and oil recycling (oil reclamation using silica gel). Extends life of insulating oils and operation of transformers. Breakdown voltage of the insulating oil is increased by 5-35 kV. Sorbents may be repeatedly used for oil processing. Can be used for drying other liquids. Directly connects to regeneration units of sorbents (BRC and BRPC). Designed to switch off one of the chambers to restore the sorbent. 1) How much oil can be processed at one time? The amount of the processed oil depends on the type of sorbent. When using zeolite, it equals 100 tons. 2) How much sorbent is lost during one reclamation process? After sorbent recovery, an average of 10-15% of its weight is lost. 3) What should be done with sorbents in the absence of resources and opportunities for their recovery? Used sorbents can be recycled by special companies that provide this type of service. 4) How long does it take to produce an individual order? The production of an individual order doesn’t exceed 45 days. 5) What is the warranty period? Generally, the warranty period does not exceed 12 months.